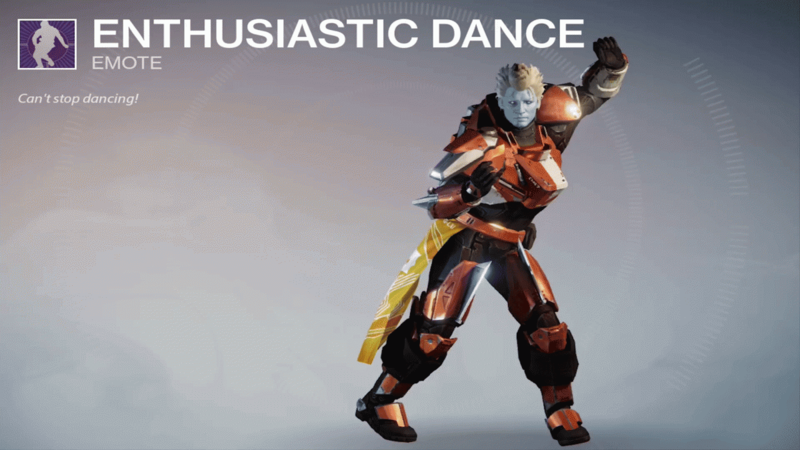 Microtransactions have finally Arrived in Destiny. Let's have a look. Microtransactions have finally Arrived in Destiny. Let’s have a look. Last week, it was announced that Destiny would be receiving microtransactions for the first time, and now they have arrived, so let’s have a look at our old friend Tess’s new wares! Currently, there are 18 brand new emotes for sale, some more exciting that others; and the game has even started everyone off with 400 silver (the game’s new premium currency) to buy a couple with! However, you’ll notice that while most of them are rare (blue), there are two which are legendary (purple), and that there is a price difference between the two (200 vs. 500). This is pretty standard fare, but it comes off as a but underhanded; they give the player a measure of this premium currency and then tell them to welcome themselves to a premium item on the house, only to show that the good stuff is just out of their reach. Next is the price of the Silver itself: $4.99 for 500, $9.99 for 1100, and $19.99 for 2300; the age-old “buy more to get more” approach. However, in its current state, the 100 silver bonus from the $10 tier isn’t enough to buy anything, and though the 300 silver bonus from the $20 tier can get you an extra emote, you’re still left with an odd 100 silver staring you down until you break down and buy more to even it up. This sounds paranoid, but this is in fact how they get you: they let a small number of left over currency sit in your inventory, staring you down until you give in and make it enough to buy that new item you want. This is common in many games, but come on, Destiny isn’t some free-to-play game, it’s a full-price release; let the people buy an emote if they want and let them be done with it. Your swank will not sway me, demon! 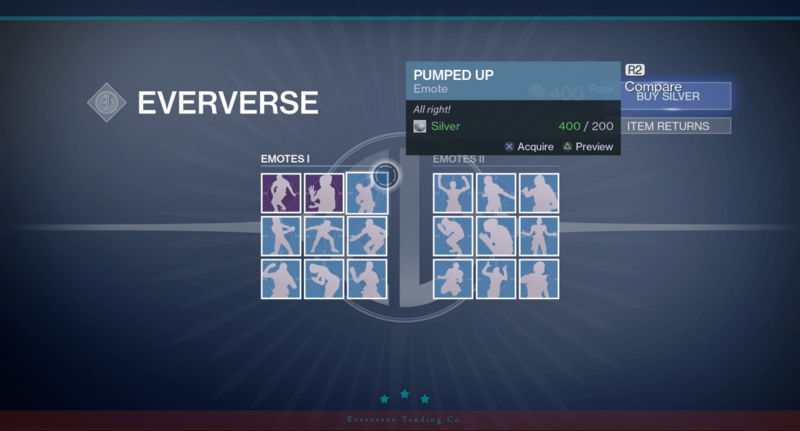 The emotes are nice, but if you don’t want to get stuck in a cycle of purchasing more and more silver, my advice is to A: hold on to your silver and see what else they end up putting up for sale, or B: buy two of the lesser emotes and be done with it for now. If you have the willpower to buy some silver and let that last 100 sit in your inventory, forever unchanging, more power to you. For now, the microtransactions seem fairly harmless, but we’ll see how the Eververse storefront looks in the coming months. But if nothing else, the ability to refund purchases within a short time frame of purchase is nice.